Today 11 of us women on the Malta tour took a bus along the seaside coast to the small town of Salina. (There are salt flats there.) 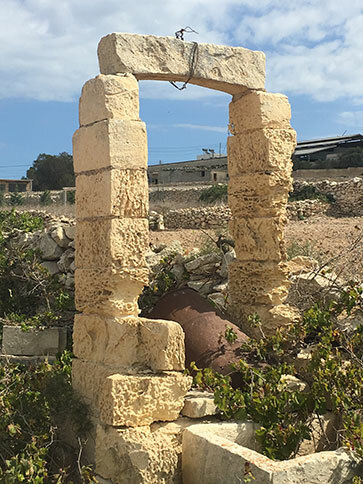 We were on an adventure to find the ruins of the Temple Tal Qadi. We got off the bus and found Charlie's Inn, our landmark. We proceeded up the hill and some of us climbed a rock wall that led to fields. We spread out and searched for the ruins. I came upon a doorway but never really found the ruins. Later we all met in another area, and found ourselves at the catacombs. I was delighted as I was longing to do some singing in the ancient caves. So on this page you will find several videos of my singing in the Catacombs.